These cookies are as spectacularly decadent as they sound. 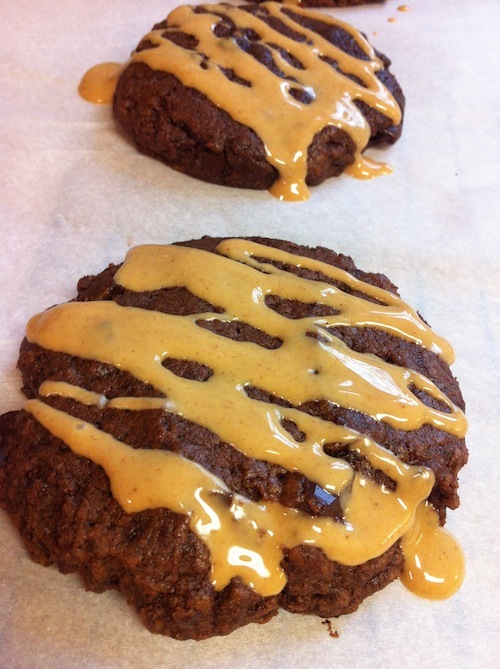 A rich chocolatey, chewy cookies, with a touch of peanut butter…it’s a wonderful combination. Be sure not to over-bake these cookies since they’ll dry out and be slightly less delicious. The type of chocolate you use will really influence the outcome, so go with your favorite. I like darker chocolate, so I went with about 60%, but the original recipe calls for milk chocolate, and I’m sure white chocolate would also be delicious if you’re into it. Basically you can’t go wrong. I mean it’s chocolate and peanut butter, what’s not to love? Please excuse the not-so-artistic picture. I made these for an event that later got canceled, so this is just a picture of my sample where I impatiently just slathered some peanut butter on top. Delicious, but not exactly the pretty drizzle I’d planned for the public consumption. UPDATED: Made these again, look how pretty they can be with a proper drizzle! 8 oz high-quality chocolate (I used semi-sweet, about 60%, but go with your favorite), chopped in chunks. Sift together flour, cocoa, salt, and baking soda, and set aside. In a large bowl, mix together butter and sugars until combined. Add the egg and the egg yolk, then stir in the vanilla until mixed. Gradually add in the dry ingredients until just combined. Fold in the chocolate chunks. Scoop large balls of dough onto a baking sheet lined with parchment paper. Bake for 14-17 minutes, until set. While cookies are cooling, make peanut butter drizzle. Heat peanut butter and coconut oil in the microwave until warmed and runny. Mix well. When cookies are mostly cool, drizzle peanut butter over the tops. Enjoy with a cold glass of milk.